Today we feature another winter seasonal beer option. 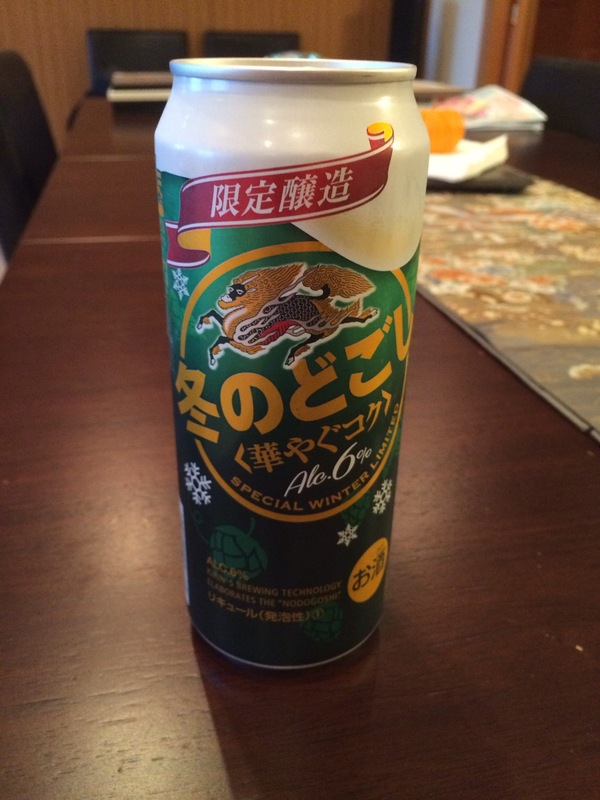 This one comes to us from Kirin and is very appropriately called “Special Winter Limited” since it is limited to the winter season only and is, therefore, special. 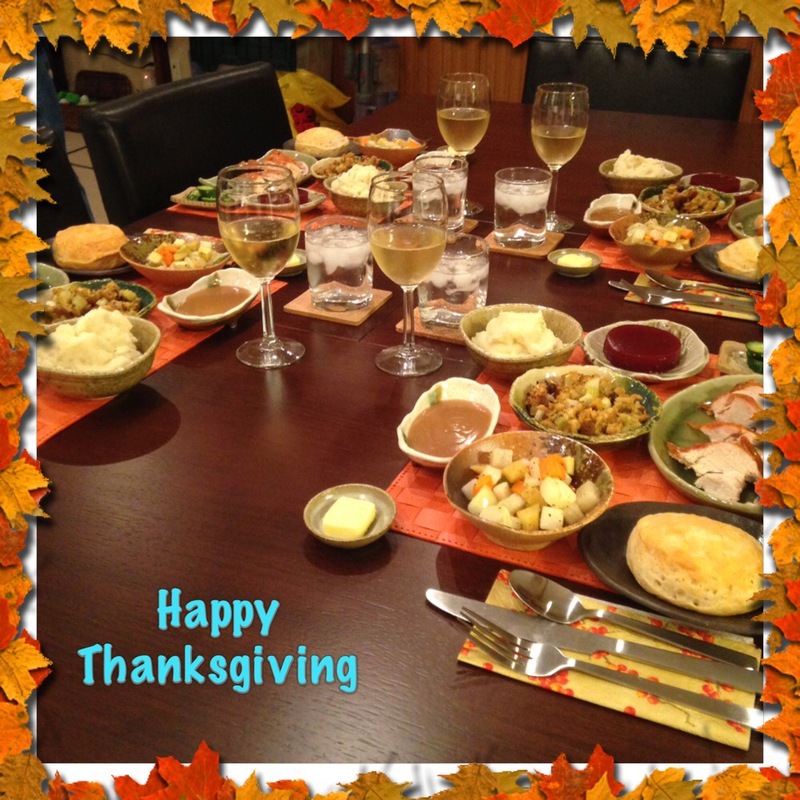 This entry was posted in food, mike on November 24, 2014 by jules453. Today is a another National Holiday in Japan. Well, actually, the holiday is November 23rd; but, since that was a Sunday, it is being recognized on Monday. While it is not part of the Happy Monday Holiday system, it is being recognized on a Monday this year. 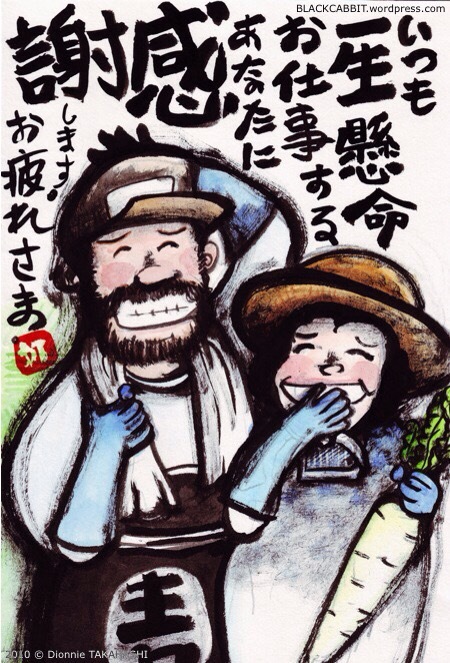 This holiday is Labor Thanksgiving Day (Kinrō Kansha no Hi); a day to commemorate labor / production and giving one another thanks. It is also a time to think about the environment, peace, and human rights. This entry was posted in culture, mike on November 24, 2014 by jules453. At the conbinis, there are pancake packs that combine two pancakes, butter, and syrup into one sandwich to allow for easy pancake-eating on the go. 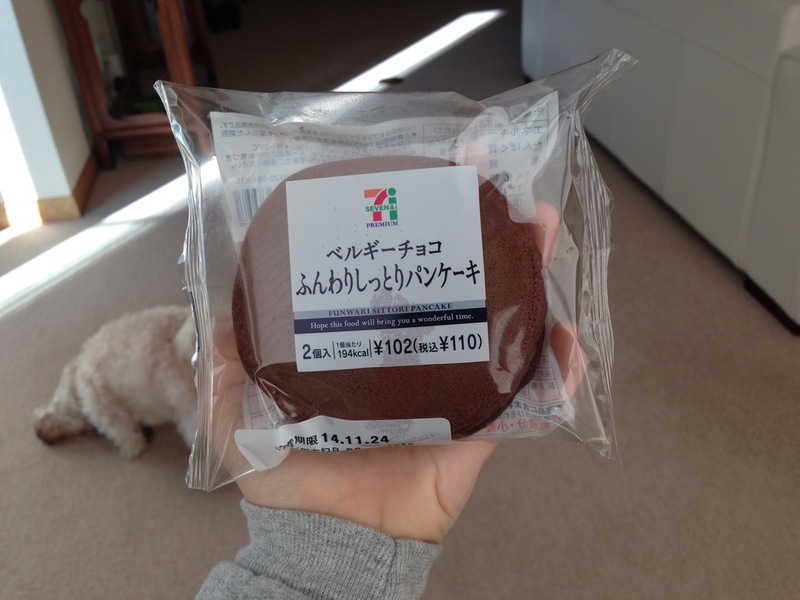 But, this past week the Seben (slang for Seven-Eleven) has stocked their shelves with these chocolate pancakes. Once you open the plastic, an aroma of chocolate cake swells from the package. But don’t be fooled by this amazing smell, the pancakes are filled with a bland creme that ruins the taste and makes breakfast less enjoyable. I think they should just have chocolate pancakes with butter and syrup. Not creme. Next time, I will be getting the regular pancakes. Please enjoy the photobomb by Xeno. This entry was posted in meg on November 22, 2014 by jules453. Last weekend we were out for a walk with Xeno and saw this small Japanese garden in the Hibiya section of town, tucked in between a 60-degree intersection. This entry was posted in general, julie on November 20, 2014 by jules453. Today’s new snack arrival at the convenience store was, not all that surprisingly, themed to the Christmas season. You may think that it is early for Christmas themed stuff. Well, without Thanksgiving to get in the way, Christmas emerges quickly after Halloween; but, disappears almost completely on December 26th. Anyway, back to the snack. 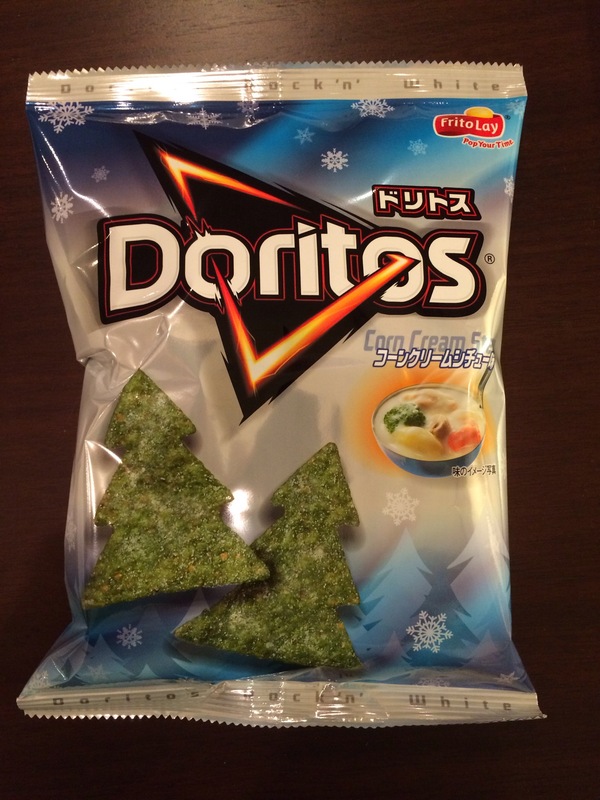 Coming to us from the Doritos brand is corn soup flavored green tortilla chips in the shape of Christmas trees. What could be more Christmas-y than that? This entry was posted in food, mike on November 19, 2014 by jules453.